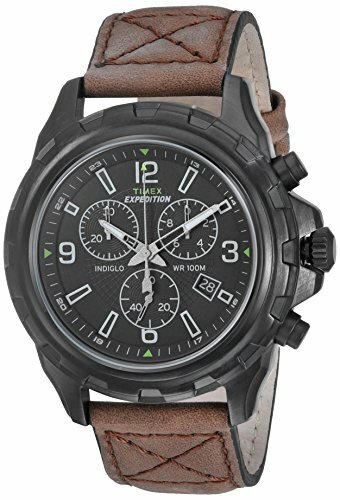 A modern take on a classic military design, the Timex Men's T499869J Expedition Rugged Chronograph Watch adds a stylish yet rugged complement to your everyday wear. The bold dial features three sub-dials that track minutes, seconds, and 1/20 of a second for up to 30 minutes. An easy to operate date window is located at 4 o’clock. With the Quick Date function, you can set the date on the watch without turning the crown for every 24-hour period. Just pull the stem halfway out, and turn until desired date is reached. It also offers water resistance to 330 feet (100 meters) and a durable leather strap. The Indiglo night-light uniformly lights the surface of the watch dial using patented blue electroluminescent lighting technology. It uses less battery power than most other watch illumination systems, enabling your watch battery to last longer.